Gene Roddenberry, the creator of Star Trek, also known as the "Great Bird of the Galaxy", passed away in 1991. His son, Eugene Rod Roddenberry was only 17 years old. As a teenager, Rod never knew the impact his father had on the world, but as a man, he'll find out ... Trek Nation is an enlightening documentary that details Rod's trek across America to discover his father through the touchstones Gene left behind: his friends, his work and his influence. Including surprising, revelatory conversations with Star Trek actors, fans, family friends and some of entertainment's most iconic figures, Trek Nation is a journey to understand one of the world's largest cultural phenomena, the man behind it, and the legacy he's left us all. 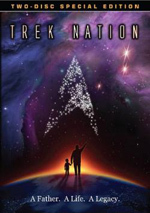 While we’ve gotten umpteen documentaries related to Star Trek over the years, 2010’s Trek Nation comes with a different perspective, as it highlights the experiences of Eugene “Rod” Roddenberry, the son of series creator Gene. This means we follow Rod as he attempts to connect with the show and the father who died when the younger Roddenberry was just 17. Along the way, we get interviews with wife/actor Majel Barrett, family friend Hilda Rolfe, fan Bjo Trimble, astrophysicist Sallie Baliunas, comic book creator Stan Lee, associate producer Bob Justman, business manager Mort Kessler, visual effects artist Doug Drexler, Futurama producer David Goodman, TNG executive producer Rick Berman, Gene Roddenberry’s executive assistant Ernie Over, Enterprise associate producer Dave Rossi, writers Christopher Knopf, Dorothy “DC” Fontana, Ronald Moore, Michael Piller, filmmakers George Lucas, JJ Abrams, Seth MacFarlane, and Rob Zombie, and actors Patrick Stewart, Victor Brandt, Nichelle Nichols, Patrick Kilpatrick, Jonathan Frakes, Wil Wheaton, Scott Bakula, and Michael Dorn. We also hear from various fans as well as Gene Roddenberry via archival footage. Through these interviews, we hear about Gene Roddenberry’s life and career. Of course, this involves a lot about the creation and development of the Original Series, but we also cover the “lean years” between that show’s cancellation and its revival. We hear a lot of appreciation for different elements and trace Gene’s work through his death in 1991. As I noted at the start, various Trek series have inspired kajillions of books and documentaries over the decades, so it becomes more and more difficult for new efforts to find an innovative path. This occurred not long ago with William Shatner’s The Captains, a documentary that focused on the handful of actors who played Trek captains. That movie suffered from its relentless focus on its director, as Shatner couldn’t resist the craving to make everything about himself. Nation doesn’t rise to the egocentric extremes of The Captains, but its concentration on Rod tends to fall flat. That’s not a problem with the premise, as a movie about how a son reconnects with his dead father could work. However, Nation explores this area in a superficial manner. Every once in a while, the movie manages some insight, but those moments occur too infrequently for those elements to benefit the program. I don’t think Rod’s presence/participation adds any greater depth than any other documentary could muster. This means Nation winds up feeling… well, like any other Trek documentary, honestly. Since Rod can’t add much of real interest, we’re left with a program that just touches on the standard “history of Trek” subjects. We get a general overview of the Original Series’ creation and its offshoots without much new to bring to the table. Of course, we get the inevitable lionization of Gene as well. Sure, the program pays lip service to some negative topics, mainly when we briefly hear of Gene’s rampant womanizing. 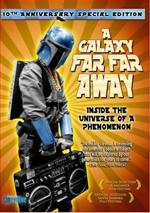 But that’s about it, as otherwise the movie attempts to foster the “Great Bird of the Galaxy” notion. Nation does come with a good array of interview participants, and they offer some useful notes. However, we rarely hear anything that’s not been said in umpteen other programs. The relative brevity of the film means they show up for short periods and don’t tell us much, though I do like the quick sequence with George Lucas; it’s cool to hear him discuss the Star Wars/Trek topics. Too bad we don’t get more “marquee moments” like that. On its own, Trek Nation delivers a competent documentary that moves at a good enough pace. It just doesn’t manage to provide anything fresh most of the time, so that leaves it as enjoyable but not essential. Trek Nation appears in an aspect ratio of approximately 1.78:1; the image has been enhanced for 16X9 televisions. Like most documentaries, this was an erratic presentation. As usual, we got a wide variety of source elements that ranged from TV/movie segments to home movies to old news footage. These components tended to be mediocre at best; they could look fine, but they could often appear soft, flawed and bland. Normally I’d notice a major difference between archival materials and interviews shot specifically for the documentary, but that wasn’t really the case. While the modern materials tended to look better than the old stuff, the former seemed surprisingly bland. The interviews displayed mediocre definition, without much clarity. Sharper shots exhibited some jagged edges and shimmering, and mild artifacts popped up along the way. Colors were consistently bland. The hues were never horrible, but they tended to seem dull and muddy. Blacks were about the same, as they looked a bit flat, while shadows could appear somewhat thick and lifeless. This wasn’t a terrible image but it was subpar for DVD. Though not impressive, the film’s Dolby Digital 2.0 soundtrack worked better than the visuals. Music showed decent stereo spread across the front, and effects occasionally materialized outside of the center. Documentaries don’t tend to dazzle with broad soundscapes, so the limited scope heard here was fine. Audio quality was good. Music sounded peppy and vivid, while effects were generally fine; they didn’t have much to do but they remained adequate. Speech varied dependent on the source but that material generally remained natural. Nothing here stood out to me but I felt the mix worked well for the material. The two-disc set includes a good variety of materials. 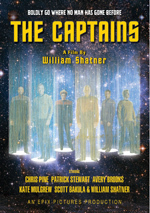 On DVD One, we get a Picture-in-Picture commentary from producers Rod Roddenberry and Trevor Roth. Both sit together to discuss the project’s development, the interview subjects, aspects of Rod’s life, the film’s focus and assembly, archival materials, and related topics. At best, Roddenberry and Roth provide a serviceable track. Although they cover a decent array of issues, they don’t often bring much insight to the proceedings. We get a few more thoughts about Rod’s life as the son of a legend, but we still don’t have a great feel for that area, and other personal subjects receive too little exploration. For instance, along the way we learn that Roddenberry and Roth are essentially life-long friends, but they barely touch on their personal relationship even though that topic would be totally appropriate here. We also encounter an awful lot of dead air, as the speakers go silent for moderately long stretches. I can’t call this a bad commentary, but it lacks many strengths. By the way, the “picture-in-picture” aspects of the commentary add nothing to it. Unlike some Blu-ray features, this one includes no behind the scenes footage or the like. Instead, we just watch Roddenberry and Roth as they chat; it’s a dull addition. The various speakers expand on the thoughts from the main documentary, as they cover their feelings/experiences with Trek and Gene Roddenberry. All of the participants provide some interesting notes, though Lucas seems surprisingly flat; I like his remarks in the feature film, so I guess they included all the worthwhile footage. Of the others, MacFarlane becomes the most compelling person not affiliated with Trek, as he offers a funny, charming discussion of Trek fandom. Berman works best from the Trek personnel via his thoughts about the challenges related to the franchise and working with Gene Roddenberry. Not all of the segments delight, but there’s a lot of good footage here. Two featurettes follow. Infinite Diversity: The Fans of Star Trek lasts 18 minutes, 23 seconds and includes notes from Rod Roddenberry, Lucas, Berman, Abrams, filmmaker Rob Zombie, astrophysicist Sallie Baliunas, fan activist Bjo Trimble, Space Shuttle commander Rick Searfoss, astronomer Karl Stapelfeldt, Muhlenberg College Professor of Religion Studies Susan Schwartz, X-Prize Foundation founder Peter Diamandis, actor Julie McCullough, Official Star Trek Fan Club founder Dan Madsen, and fans Bill Willis, Charlie Bluehawk, the Smeal family, Mario Lira, Daniel Pepper, Greyden Beyer, and George Pimenthal. They talk about how great Trek is and how great the fans are. A few mildly interesting thoughts pop up along the way, but not enough to make this a stimulating piece, especially since we already hear so much of this material in the main film. A Star Trek Is Born goes for two minutes, 18 seconds as it shows Rod Roddenberry with writer/family friend Christopher Knopf. He discusses how Gene Roddenberry shared the roots of Trek with him. It’s intriguing but too brief to give us much. In addition to the film’s trailer, we find two segments under Home Movies. 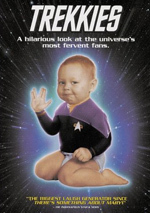 A “Compilation of Rare Gene Roddenberry Home Movies” fills eight minutes, 43 seconds and shows exactly what it implies: old personal footage of the Roddenberry clan. Rod throws in a few notes, though much of the material passes without comment. We find nothing revelatory but the clips are fun to view. “Star Walking” takes us to 1986 and Gene Roddenberry’s Hollywood Walk of Fame induction. It runs 16 minutes, three seconds and shows the entirety of the ceremony. Of course, this means a lot of happy talk, but it’s still entertaining to get a reunion of various Trek personnel. As a documentary, Trek Nation provides a decent overview of topics related to the franchise and its creator. However, it doesn’t tell us much that will seem new to fans, so while it entertains well enough, it lacks much freshness. The DVD features mediocre picture and audio along with some decent bonus materials. Nation delivers a competent documentary but not anything more.